1. Pressure cook whole beetroot with skin. Cool, remove skin, cut into cubes. 2. Heat oil; fry the chopped onion. 3. Add ginger garlic paste, tomato puree and cook till oil separates. 4. Add red chilli powder, corriander powder, turmeric powder, garam masala. 5. Add a little water. 6. 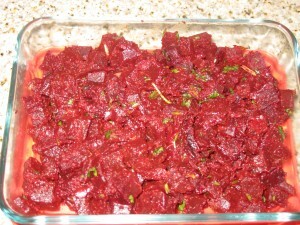 Add the beetroot cubes. 7. Mix well and cook it covered till beetroot cubes are coated with the masala. 8. Temper with mustard seeds, jeera seeds, whole red chilli and curry leaves. 9. Garnish with corriander leaves.